Preheat oven to 375F/190 C and set out a 9x13-inch baking dish or rimmed baking sheet. Also brush halved peppers with a neutral, high heat oil, such as avocado or coconut. Set aside. Prepare cauliflower rice by blitzing to a rice like consistency in a food processor. Then heat a large rimmed skillet over medium heat. Once hot, add oil, garlic, onion, salt and pepper. Sauté for 1 minute, stirring frequently. Then add cauliflower ‘rice’ and stir to coat. Place the lid on to steam the rice for about 1 minute, then remove from heat and transfer the mixture to a large mixing bowl. Add remaining ingredients - black beans through to salt and pepper - to the cauliflower rice and mix to thoroughly combine. Taste and adjust seasonings accordingly, adding salt, pepper, or more spices as desired. Generously stuff halved peppers with ~ 1/2 cup of the mixture until all peppers are full (you may have a little leftover filling, which can be added to salads or served on the side), then cover the dish with foil. Bake for 30 minutes covered, then remove foil, increase heat to 400F/204 C, and bake for another 15-20 minutes, or until peppers are soft and slightly golden brown. 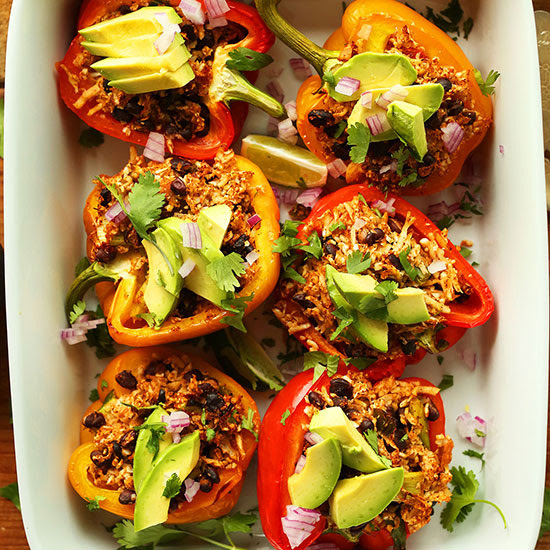 For softer peppers, bake 5-10 minutes more. Serve with desired toppings or as is. I recommend avocado, lime juice, hot sauce, and cilantro. Best when fresh, though leftovers keep covered in the refrigerator for 2-3 days. Reheat in a 350F/176 C oven until warmed through - about 20 minutes. This dish looks lovely colourful and very wholesome. Will definitely try it.